Not too long ago I went to a Mets Game. I’m not the biggest sports fan, but every now and again it is nice to take yourself out to the ball game, by some peanuts and generic caramel corn and nut product, the works. Those of us who aren’t religiously devoted to the game, or who are seeing a game between two teams you aren’t terribly invested in, quickly learn something about this most American of sports. It is BORING. Before you start burning me in effigy for being un-American, let me explain myself. It isn’t that I don’t like baseball. It is a good sport. In this particular instance, though, I was watching the Mets playing the Marlins, two teams I could care less about and I couldn’t care less about, respectively. It would have been hard for me to drum up any enthusiasm even if it wasn’t so hot and humid that I felt like I was doing a tour of duty in Da Nang. So as I sat there sweating buckets into my free beach towel, I started analyzing the sport. Never analyze anything you even remotely enjoy. It reveals flaws that will bug you from that point forward. Consider yourself warned. 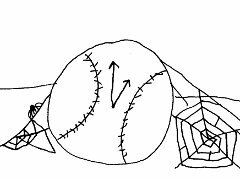 Baseball’s paralyzing boredom is dyed in the wool with the very design of the game. There are no turnovers, so for fully half of the game your team has no chance to score. That leaves you, the spectator, hoping against hope that nothing happens. Your primary defensive player is the pitcher, who if he does his job exceptionally well will constantly trick the batter into just standing there as a ball goes sailing by. Occasionally you will see something fans call a pitcher’s duel. This is when both pitchers are so good that virtually no points are scored for the entire game. How very exciting… I realize that this is great at building suspense, but as far as I’m concerned suspense is only worth it if it leads to something spectacular. If I watch a one run pitcher’s dual, and the run was a homer on the first swing, then in essence exactly one exciting thing happened in three hours. The rest was nine and five sixths long innings of people playing catch. The very interesting shoes warn by the shortstop. The plot of Maid in Manhattan. The last time each announcer had had a really good steak. When people who are paid to become experts in your sport find themselves discussing forgettable J-Lo vehicles, you might need to spice up your offering. And while basketball, a sport in which no more than 24 seconds is allowed to pass without a scoring attempt, and football, a game about gigantic men trying to kill each other for a ball, each have cheerleaders, all baseball has is costumed mascots. This is probably because now and then a rock hard ball goes rocketing in unexpected directions across the field, which might prove detrimental to any scantily clad entertainers, but I submit that this would only increase their contribution. Say what you will about acrobatic women in short skirts scattering to avoid being pummeled, it isn’t boring. In general, going to a live event makes it more interesting than seeing it on TV. You are around lots of other people. People supporting opposite teams are sharing a section. There is screaming. There is beer. It is a good time… except for the fact that live baseball is an elaborate and ingenious form of torture and extortion. Follow me here. Most of the season takes place during the hottest months. Barely any stadiums are climate controlled, the games last for hours, and the drinks cost five times more inside the building than they do outside. You bake a crowd in the sun, in the middle of the summer, for hours on end, and charge $6 for a beverage? That’s not a sport, its a war crime. Baseball his its moments, and it is a great thing to have on in the background while you are doing something else. The athletes are impressive, the highlights are interesting, and the 162 games a year mean you’ll always have plenty to look forward to. It just isn’t exactly a riveting spectacle for the casual observer. I usually end these articles with a plea for you to leave your comments, but frankly I’m sort of afraid of what sort of ill will I might have kicked up, so this time around I’ll be content to have no comments whatsoever. See you next time.